Is Education Losing the PR War? As admissions officers and higher education marketers, we are out there "selling," "marketing," and "explaining" our institutions and services. We are all committed to the value of education. 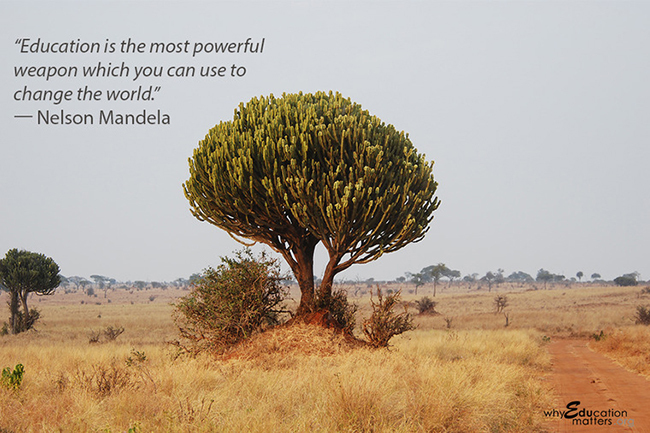 Most of us appreciate the environment and respect the act of learning. University academic staff liked college so much that they never left school! But what is happening around us? We are selling into an environment that does not necessarily prioritize education for the sake of education, but is rightly looking for a preparation for life with a focus on professionalism. We need to justify the expense. We need to show the long-term Return on Investment (ROI) But admissions officers cannot do that by themselves. Sometimes I feel like saying to academic leaders, "Wake up! Your institutions will die a slow but certain death over the next 10 to 20 years if you don't make changes." The media fervently reports the competition for admission into the Ivy League colleges. This year again, with the exception of the scandal that affected Dartmouth, all highly ranked, Top 25 to 50 U.S. News & World Report ranked colleges seem to have received record numbers of applications. Who cares? We parents, who want our children to attend these highly selective colleges, care. I love the institutions that have helped the US build a global reputation for world class education and help us fill the Supreme Court benches. But what really matters are the other 2,475 4-year colleges and the 2,000 two-year colleges. What stuns me is our acceptance of downgrading the value of education without fighting it As a global education marketer, I look for institutions, partners and clients who want to win. Winning refers to institutions that want to provide an excellent education, help young people succeed in life, grow their student population and maintain a financially viable long-term institution that supports students, alumni, staff and the surrounding community. Recently, I read this article in the highly reputable "The Economist" magazine, "Education Worth it" . 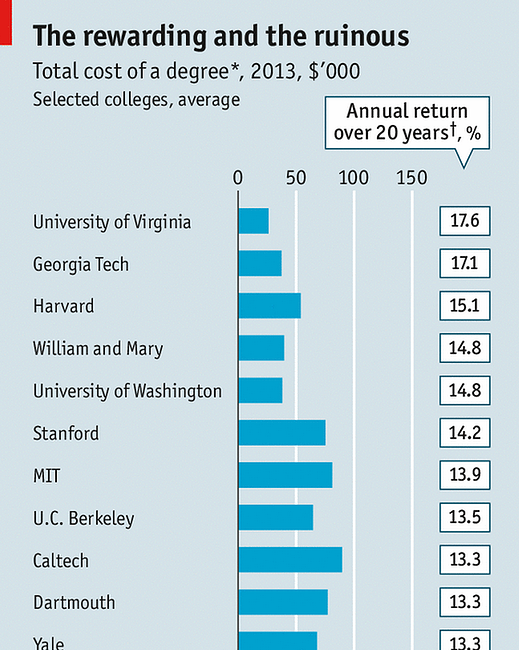 You can see below the chart of the ROI presented in the Economist article. As you can image the ROI does not get better as the list of schools continues. But look at the social media impact of the article below -- 9,700 likes (Yikes). How do you feel as a parent or student about any other service or product that you are planning to spend $10k, $20k, $50k per year for the next number of year? For students this is the biggest purchase made in their lives. For parents it will be the second biggest purchase after their home and retirement savings. Are you going to buy this lemon of a car? I don't want to leave you with this unfortunate description. I'd prefer to end on a positive note. I wish that our university presidential leaders and the dozens of university associations would collaborate and organize a "Got Milk" campaign for higher education. Remember that campaign? Well, here is our small contribution to generate some good will and create some social media momentum to support education. "Why Education Matters" is our contribution to give all academic institutions FREE social media content to distribute. Let's create the right attitude and a positive PR campaign. Remember when a majority of the population didn't believe that global warming was real. You may or may not think highly of Al Gore but I feel that his constant advocacy and his famous powerpoint presentation on the facts of global warming have made a real difference in forming public opinion. Let's make sure that we are not ignoring the public mood. Let's work together to support publicly our passion and dedication to education. Good education requires commitment and investment on a personal, institutional and governmental level.